Many have criticized the Indian government for what some interpreted as a deliberate snub of visiting Canadian Prime Minister Justin Trudeau on Saturday. While Indian Prime Minister Narendra Modi has greeted many other visiting dignitaries in person at the New Delhi airport, he dispatched Minister of State for Agriculture Gajendra Singh to do the honors for Trudeau. “It must be noted that Modi was in Delhi at the time of Trudeau’s arrival, and today the Canadian PM will be paying a visit to Gujarat, the Indian PM’s home state, where he will visit the Sabarmati Ashram and the Akshardham Temple. Modi, more often than not, escorts dignitaries visiting Gujarat,” Pakistan’s Dawn newspaper noted on Monday, adding Chinese President Xi Jinping and Japanese Prime Minister Shinzo Abe to the list of VIPs who found Modi waiting for them when they strolled down the airstairs at Indira Gandhi International Airport. The UK Telegraph observes that only district officials accompanied Trudeau during his visit to the Taj Mahal on Sunday. Even some of the higher-ranking officials in the state, where the Taj Mahal is located, appear to have snubbed him. The protocol response did not exactly answer the question of why the government treated Trudeau differently from other leaders when Modi clearly could have made time to meet him at the airport. “Yes, this is a major snub. 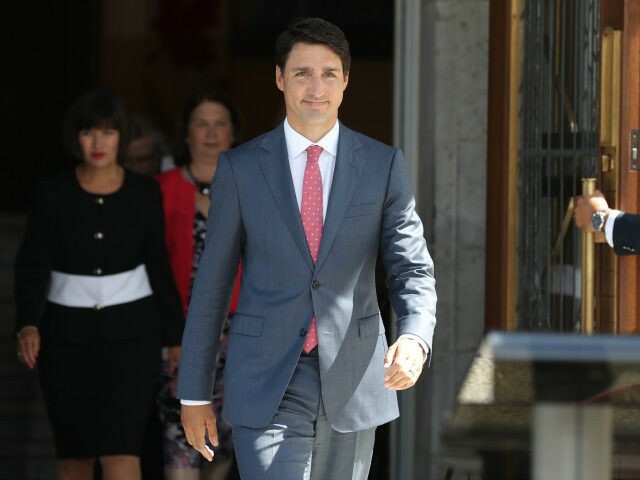 The fact that a junior minister was sent to receive Mr. Trudeau and his family is most definitely a snub,” declared Indian columnist Vivek Dehejia, completely unconvinced by the government’s protestations to the contrary. Suspicions persist that India’s government, currently run by Modi’s nationalist BJP party, was expressing its displeasure with Trudeau’s evident support for Sikh separatists in the Khalistan region of Punjab. The notion that some portion of Punjab rightfully belongs to the Sikhs dates back over 300 years and remains part of the liturgy in regional Sikh temples to this day. The most extreme members of the movement believed all of Punjab should be partitioned into a Sikh state. Pakistan occasionally responds to Indian accusations of supporting the separatist movement by pointing out that the most grandiose maps of Khalistan include a good deal of Pakistani territory as well. The airport at which Trudeau landed in New Delhi is named after Indira Gandhi, the Indian prime minister assassinated by two of her Sikh guards in 1984, provoking nationwide riots and a security response compared by some Sikh leaders of the day to genocide against their people. Unlike Turkey’s Kurdish separatists, the Khalistan Movement transitioned out of violent terrorism in the mid-90s and became more of a grievance movement, gradually losing political coherence and seeming to collapse completely by the current decade, only to return suddenly as both a political force and terrorist threat beginning around 2015. A huge seizure of arms near the India-Pakistan border by border security forces in May of this year alarmed the Indian government, which has been exploring a network of connections between old-school Khalistan terrorists, youth movements, Pakistan’s eternally troubling ISI intelligence agency, and overseas groups. The Indian government has expressed concerns to several countries, including the U.S. and Canada, about groups of Sikh expatriates sending money back home to Khalistan organizations. Canada has a large Sikh population with growing political and economic clout, often hailed as a remarkable immigrant success story given the chilly reception Sikhs received a century ago. The last few waves of Sikh immigrants brought a dose of Khalistan ideology with them. In March 2016, Trudeau touched off a firestorm in India by saying, “I have more Sikhs in my Cabinet than Modi does” during a state visit to Washington. Another firestorm erupted when Punjab Chief Minister Amarinder Singh repeatedly accused Trudeau of harboring “Khalistani sympathizers” in his Cabinet. Singh is himself a Sikh and recognized in India as a war hero, but he is an outspoken enemy of the Khalistan Movement who has gone so far as refusing meetings with Indian officials he deems sympathetic to the separatists. Addressing these concerns, and possibly meeting with Singh to work out his grievances, was high on Trudeau’s agenda for his India visit. Trudeau would have to be incredibly clumsy and tone-deaf not to understand he was sailing into rough political waters. The Canadian prime minister is certainly no stranger to accusations of clumsy political pandering and tone-deafness, but the more optimistic interpretation is that he took his lumps from India’s political establishment with the airport snub, walked it off with a tour of the Taj Mahal, and can now set about restoring strained Indo-Canadian relations. Trudeau’s office confirmed on Monday that he will indeed meet with Singh. One of the Canadian officials Singh accused of harboring Khalistan sympathies, Defense Minister Harjit Sajjan, is traveling with Trudeau and may or may not be in attendance at the meeting. Business issues were also a major component of Trudeau’s visit, and with his announcement of a billion dollars in new deals good for almost 6,000 jobs in Canada, that aspect of his mission seems to have been successful. Still on Trudeau’s to-do list is convincing India to lift protectionist tariffs on Canadian agricultural products, particularly peas, which comprise an astoundingly large share of Canada’s exports to India. At this point, all Trudeau is saying is to give peas a chance.